i already have a proyect using Nuxt and i want to make it an APK, how can i install this template to an existing proyect without affecting the code already writen?? Configuring yargs through package.json is deprecated and will be removed in the next major release, please use the JS API instead. gyp ERR! command "/usr/bin/node" "/usr/lib/node_modules/node-gyp/bin/node-gyp.js" "configure" "--fallback-to-build" "--module=/mnt/data/workspace/retrobox/desktop/node_modules/lzma-native/binding-v3.0.8-electron-v2.0-linux-x64/lzma_native.node" "--module_name=lzma_native" "--module_path=/mnt/data/workspace/retrobox/desktop/node_modules/lzma-native/binding-v3.0.8-electron-v2.0-linux-x64"
node-pre-gyp ERR! command "/usr/bin/node" "/mnt/data/workspace/retrobox/desktop/node_modules/lzma-native/node_modules/.bin/node-pre-gyp" "install" "--fallback-to-build"
Hey guys, I am trying to figure out how to start a nuxtjs app with express and electron. What I have tried so far is using the express-template and installing electron, electron-devtools-installer then I copied the main.js code to start electron from electron-template and pasted it into the start method in the express-template, it runs without errors but electron isn't showing up. 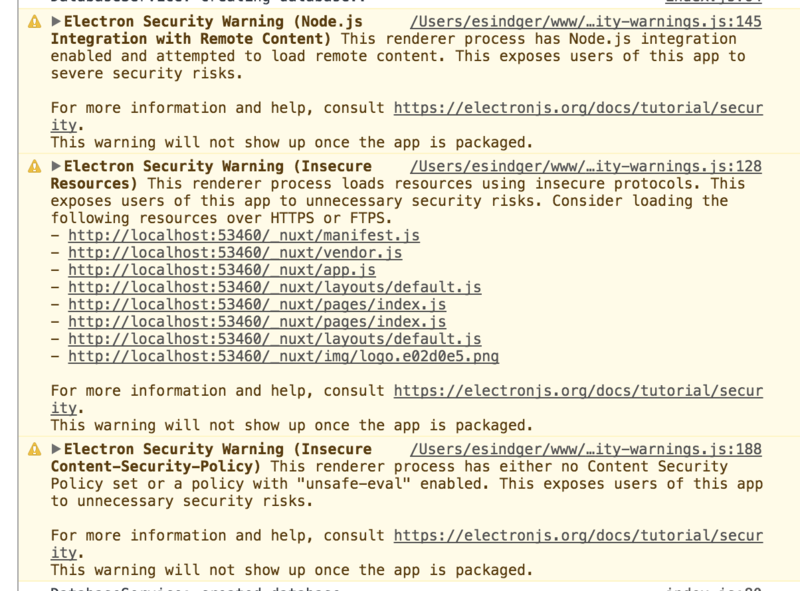 … and then modify a component to use SCSS and it will literally break in pieces in a sea of red. This should not be happening at all guys! Create a new, empty project, cd into the project, and run npm i.
I want to use knexjs in my components and the only way I made it to work is creating the knexjs instance in the main.js (I also tried to do it in a plugin, but knex failed to run). 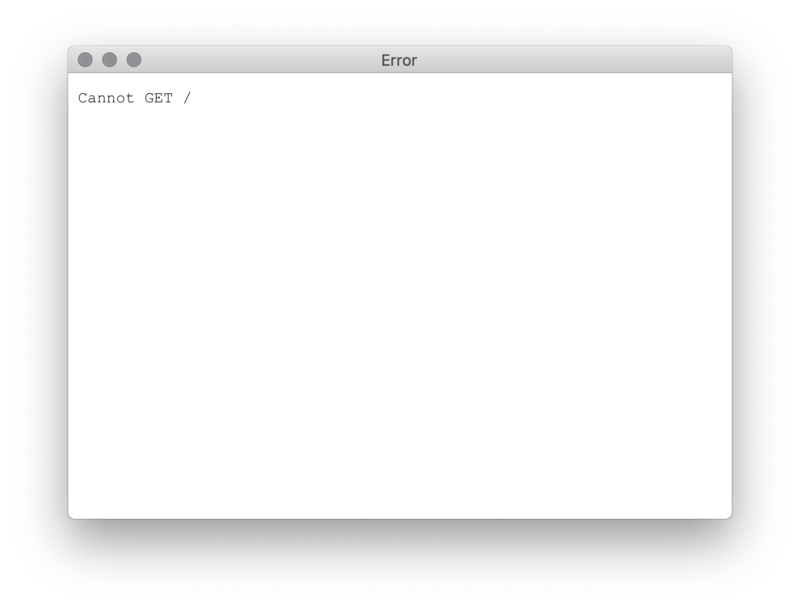 Although everything looks fine when I run locally at http://localhost:3000/, the app that is built with Electron is just a blank white screen. I feel like I'm missing something obvious here! Hello, is there any way to fix this warning? Since there are differences compare to this template, for example the repo structure is so different since it is a template for creating new project via vue-cli and electron-builder is used by default to build the app, it may not a be a good idea to submit a pull request here. Any idea? Today to use this repository it is necessary to make a clone, why not add it to vue-cli so that users can only start it with vue init nuxt-community/electron-template <folder>, there is some restriction so you have not done so?